President Donald Trump hosts Nigerian President Muhammadu Buhari at the White House Monday, April 30th 2018. The event marks Trump's first official visit from an African head of state. President Muhammadu Buhari has fired back at the United States President, Donald Trump over alleged claims by the American leader referring to the Nigerian president as "lifeless". The reaction which came through the Buhari Media Organisation BMO was in response to Monday's report by the Financial Times that the American President had made disrespectful comments imputing ill health on President Buhari. "President Muhammadu Buhari is fit and capable to run for the 2019 elections and oversee the affairs of the country for four more years President Donald Trump's hate speech notwithstanding", the group said. The BMO in the statement signed by Niyi Akinsiju and Cassidy Maduekwe, its Chairman and Secretary respectively, noted that this was not the first time the US President was heard to make such derogatory remarks at World leaders, and thus President Buhari would not be distracted by such. "We are aware that President Trump's disrespect for World Leaders is not new; his comments on Canada's Prime Minister, Justin Trudeau, calling him 'meek and mild'; his reference to Germany's Leader, Angela Merkel's actions as 'insane', or his outlandish Tweet at the UK's Theresa May, and more recently, the alleged remarks he made after meeting President Buhari. "It is indeed not the first time President Trump would be heard to lower the standards of respect for his colleagues on the World Stage. We are not surprised, we know that this age-long character of the US President would not change anytime soon. But it is important that we put it on record that President Buhari remains fit and sprightly, even for the next decade", they added. 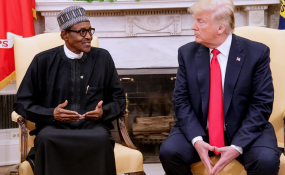 "We recall that during President Buhari's visit to Trump in the White House, the US President commended the successes that the Buhari administration had recorded especially in the fight against insurgency and the war on corruption. The US President was full of admiration for Nigeria's President during the visit, thus such outlandish remarks as reported by the Financial Times are not just to be taken with a pinch of salt but are untrue in themselves." The group noted that President Buhari has continued to show fitness and capacity to run the country post-2019; it went further to highlight that though the President's 800 metre walk, where he acknowledged the cheers of members of his constituency, was not intended at showboating, it was an unscripted reference point that further proves a fit and lively President. The BMO noted that President Buhari would not be distracted by this report, whether it was indeed said or in fact unsaid, but would in his character continue to remain focused on his mandate to deliver on his promises to the Nigerian people.